According to a scene in the acclaimed movie, The Social Network, “the Internet is written in ink – (and) not in pencil”. But if that’s really the case, how come it’s close to impossible to browse and search old tweets on Twitter? How come our 140-character text updates seem to have expiration dates on them? Note that we say, “close to impossible”: operative word is ‘close’. Because surely, there must be a way, right? There must be a way somehow to archive your tweets (or someone else’s) so that you could read, search, share, and store them all in one place. And there must be a way to access those precious tweets whenever the Fail Whale pays Twitter servers a visit. Worry not. There is a way. Or ways. Here’s Lakeshore Branding’s quick guide to creating your very own Twitter archive. Thanks to the awesome talents of today’s developers, anyone with a WordPress site or blog can now archive their tweets and automatically publish them as posts. A WordPress plugin called Twitter Tools does the job, integrating your blog and Twitter account in several ways. If you want to create backups of your personal tweets as well as that of your friends (or the people you follow), then an RSS reader – like Google Reader – just might be the best way to go. There’s another sweet tool called TweetBackup, which, as the name implies, grabs all your tweets from your Twitter account (as well as a list of the people you follow) and backs them up as an RSS file, which you can then save and import to your WordPress site. It runs over the Web, so there’s no need to install anything on your computer. There’s also a neat plugin called Twitter Importer, which does the same thing – importing tweets via RSS – for WordPress 3.0 (or higher) users. Like Twitter Tools, Twitter Importer can automatically generate posts for your WordPress site, while allowing you to choose the category and author under which these posts are assigned. One of our favorite Twitter archiving tools right now is the web-based Twapperkeeper. Funny name, sure, but it does pretty serious work. 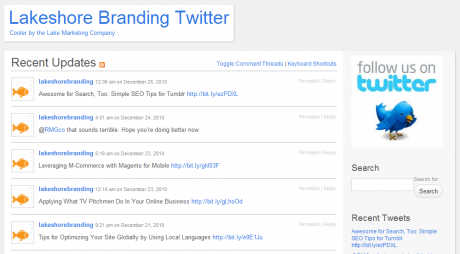 It can archive tweets based on hashtags, keywords, or even Twitter users. You can even keep a collection of Twitter archives, which you can then read, analyze, search, or perhaps just keep out of sentimental value. Do you want your tweets saved in your Outlook, Thunderbird, or Google Calendar? Twistory is your knight in shining armor. Or the butter to your bread, whichever you prefer. With a basic version that’s completely free of charge, Twistory users can create their very own tweet diaries and add their Twitter backlog – all the way up (almost) to their first tweet ever – to any calendar application that supports the iCal format.